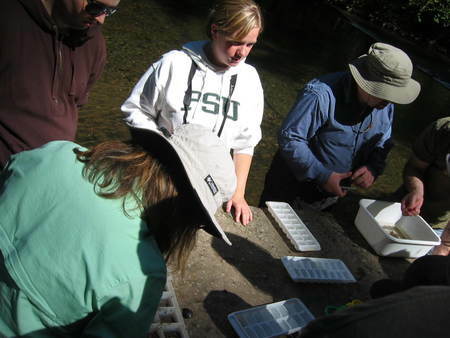 The Clackamas River Basin Council partnered with Portland State University for several years to monitor water quality in area creeks during summer months. As part of their Capstone projects, students collected water quality data on macroinvertebrates, temperature, pH, turbidity (water cloudiness) and other factors, then produced a professional report interpreting those findings which was mailed to area landowners. Students and CRBC also attended A Day in Damascus, a local celebration occurring in July each year, to educate families about the importance of water quality.